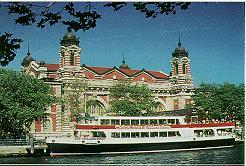 Jersey City History - Old Bergen - Preface. 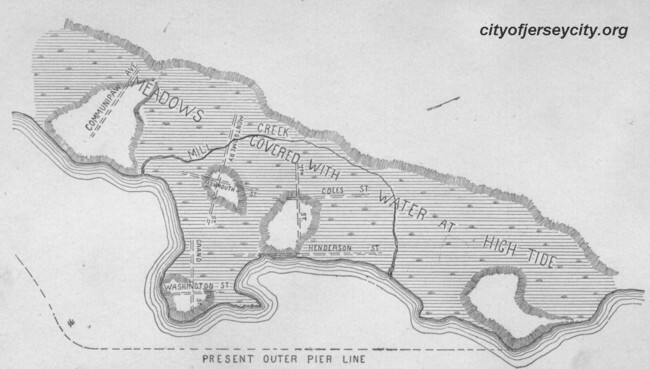 Original shore line and topography of "Old Bergen" now Communipaw -- lower Jersey City and Hoboken. This little volume is projected with the hope of exciting a new interest in the territory of which it treats. From its antiquity and historical importance, "Old Bergen" deserves more than a passing glance. Founded during the infancy of our country, and standing at the gateway of the continent, it was subjected during the colonial and revolutionary period to the privations and vicissitudes peculiar to those early days, to an unusual degree. Although located under the shadow of a great city, its bosom seamed and scarred by the ebb and flow of the traffic and commerce of the Great West, it preserved until very recent years the customs and conditions of "The Long Ago." The people inhabiting its territory, retaining to a great extent the characteristics and conservativeness of their forefathers, were oftentimes visited by their city neighbors, when tired and worn with the cares and anxieties of a business life, to secure a momentary relaxation and rest among their peaceful surroundings. Although by no means exhaustive, the matter presented in this book is reliable and authentic. It has been procured from all available sources and carefully selected:	The historical facts, from colonial records and revolutionary documents; libraries have been freely consulted, and files of old newspapers scanned in search of matters of local interest, while the traditions and reminiscences indulged in from time to time, have been gathered through a succession of generations, and many of them here rescued from that oblivion into which so many have fallen. A few generations ago, much unquestionable traditionary information could have been secured, but owing to the lapse of time, traditions have been forgotten and documents destroyed, that might have aided us greatly in our search for information affecting the homes and people of "Old Bergen." Through the general growth of our country and changed conditions, "Old Bergen" has been absorbed by the greater Jersey City, and lost its identity in its new relations. With the hope of rescuing its name from oblivion, and that other investigations may be continued, to secure more fully, whatever there may be of existing data relating to the "Olden Days," this volume is issued. Bergen (Jersey City Heights), January, 1902.